Here is an article that shares tips on how to achieve fast chord changes as you learn guitar. My experience with speeding up chord changes is that you have to slow down and get things right first. When you perfect the chord change movements speed increases easily with regular practice. Your first step is to set the target your want to achieve. Decide the chords you want to change and the tempo you need to play them at. Once you know the tempo at which you want to change chords smoothly your next step is to find out where you are now. The tool to do this is a metronome. Use a metronome to learn how fast you can change the chords now. Set a tempo near to your target speed and play the chords you chose, changing every four beats. If you can't change this fast reduce the speed until you can change without error. Now slow down your metronome a few more steps. Analyse your movements in detail. Do all your fingers move immediately and smoothly into place? Do any of your fingers make unnecessary movements away from the strings? Study how you make the chord changes and learn where you go wrong. Your aim should be to have all your fingers move the least possible away from the strings. 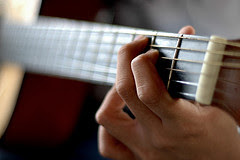 The less distance your fingers travel the easier it will be to change chords fast. You have to start by consciously figuring out the best movements for getting your fingers from one chord position into another. Then you can consciously practice those movements using the techniques described below. I use a number of practice techniques to master chord change movements. The important thing with all of these is to work slowly. You need lots of conscious attention to ensure you move your fingers correctly. You can only achieve this at very low speeds. Now, here are four tips to practice the chord changes effectively. 1. Fret hand practice. Practice the change with only your fretting hand. 2. Practice without pressure. Place your fingers only lightly on the strings without pressing down. This helps you to focus on simply getting the fingers into the right place. 3. Static chord holding. Place your fingers in the correct chord position and simply hold them there. This is a good way to get used to the feel of particular chord positions. When you can rely on your feel you don't need to rely so much on your eyes. 4. Grab the chord in the air. Release the chord and let your hand drop to your lap. Then move your hand back up and form the chord in the air before your fingers reach the neck. All your fingers should land on the strings in the right place at the same time. Repeat several times for each chord. 5. Fast chord sequences. Move your fingers through a sequence of chord positions one per beat. This technique is best when you are already good at the individual changes and want to get used to thinking ahead to new positions quickly. Once you master the exercises above at slow speed gradually increment the tempo of the metronome, one or two steps at a time. If at any point your fingers start to get sloppy or you make mistakes again, drop back down a step or two. It's important to always practice at a speed where you make the finger movements correctly. These exercises can help you to develop your ability to play fast chord changes. Work regularly and dedicate a little time to master each chord or set of chords before you move on to the next. For all this work a metronome is an essential tool. Make sure you choose one that makes it easy to adjust the tempo as you work. Do you know any other fast chord change exercises I should have included? If you have a good exercise to build fast chord changes please share it by leaving a comment below. That's a good idea too. Thanks for sharing.